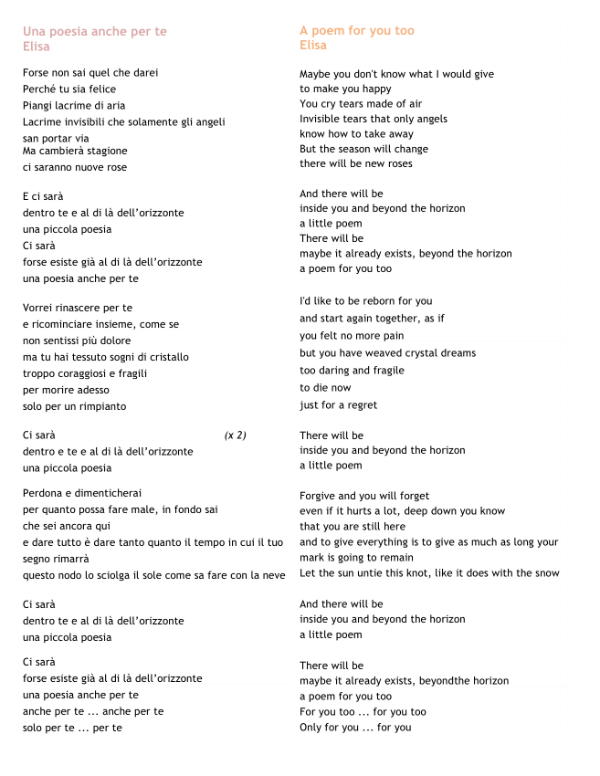 With the official start of Spring just days away, I was reminded of this beautiful tune by Elisa, entitled, "Una poesia anche per te." This beautiful ballad speaks of new beginnings, and the video that accompanies it hints at the fresh start of spring with it's flower backgrounds, and yellowish-green grass. You will also note in the video, that Elisa is much younger than the singer you see today. This is due to the fact that this song is actually just over 10 years old, as it was released in 2005. The song became the fourth best selling single in Italy that year. In fact, I was in Italy during the summer of 2005 and was lucky enough to see Elisa perform this live! It was an incredible experience to say the least. Check out the video below, and as always, you can find the lyrics after the video, to help with your language learning! Buon ascolto! ~ Happy listening!